Thanks to all who attended the Wassail on Sunday, for once it was neither raining nor snowing! We had a good attendance of all ages and everyone enjoyed sitting round the fire, eating, drinking, chatting and singing the Gloucestershire Wassail song to accompanying tambourine (inexpertly played by Jane……) By the time it was dark we were ready to choose a King and Queen of the orchard who led the procession around Ash Field making a good amount of noise and pausing now and then to ‘Hurrah!’ the trees and for the children to hang toast dipped in cider in the branches. Most enjoyable! This ceremony was originally carried out in cider orchards in the West Country but has now spread all over so we are proud to be part of a long tradition – and its a lot of fun too! 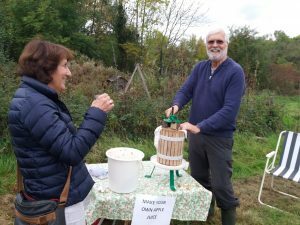 Thanks to all who attended our Apple Day on October 8th. The weather was kind to us and it was lovely to see so many folk come and enjoy the Orchard including some who had not been before. 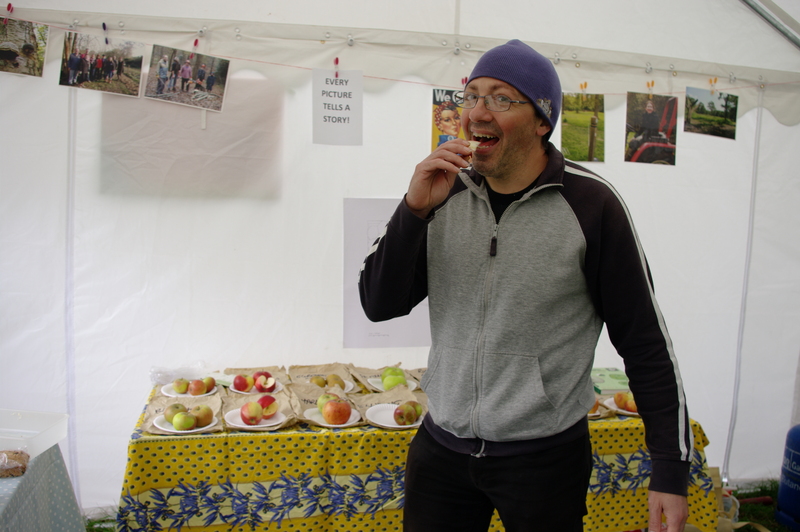 Its been a wonderful year for fruit and for the first time we had some apples from our own orchard to taste along with some kindly donated by Forty Hall farm. It was especially great to see so many children, they particularly enjoyed having a go at scratting and juicing some apples and tasting the delicious juice they produced. Thanks to Roger and Isobel for manning that. A big thanks is due to Janet and Brian for the wonderful clay modelling with a variety of Green Men plaques being created by all ages. Also to Pippa for sterling work with Guess the Weight of the Cake, June for her wonderful cakes and Kate and Co. for helping with the clear up. Finally thanks to Ralph and Toni for the loan of tables from the Northaw Scouts. 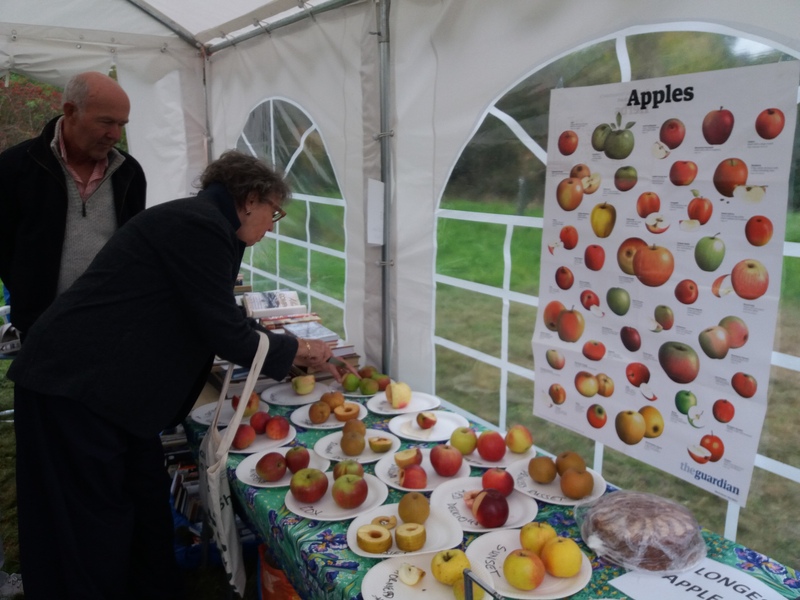 Thanks to those who attended Northaw Transition CICs AGM which was held on October 8th, the same day as the Apple Day. It was great to have an opportunity to present a roundup of our news and to formally thank all those who have volunteered this past year. We have recorded 300+ volunteer hours since the start of the year – running the orchard would not be possible without that support. 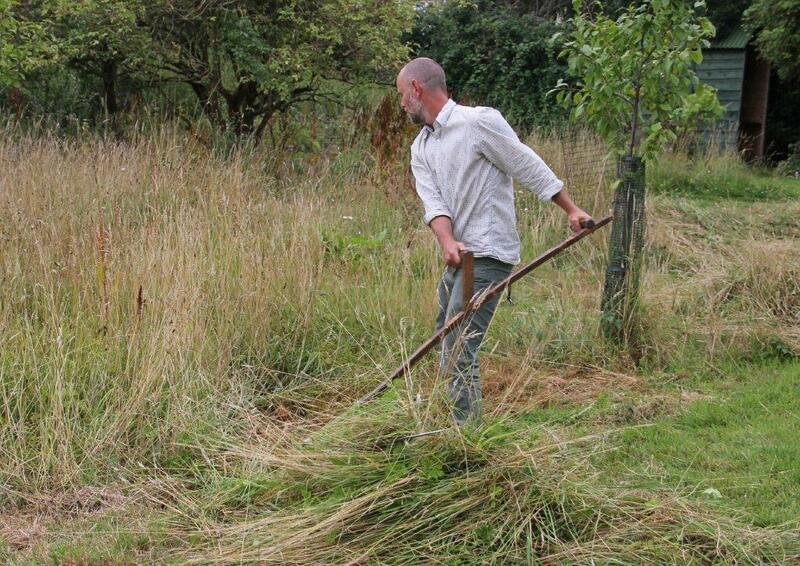 After several moths of fine weather it came the time to mow and rake and the showers descended. Trying to find a dry day for both activities proved testing. 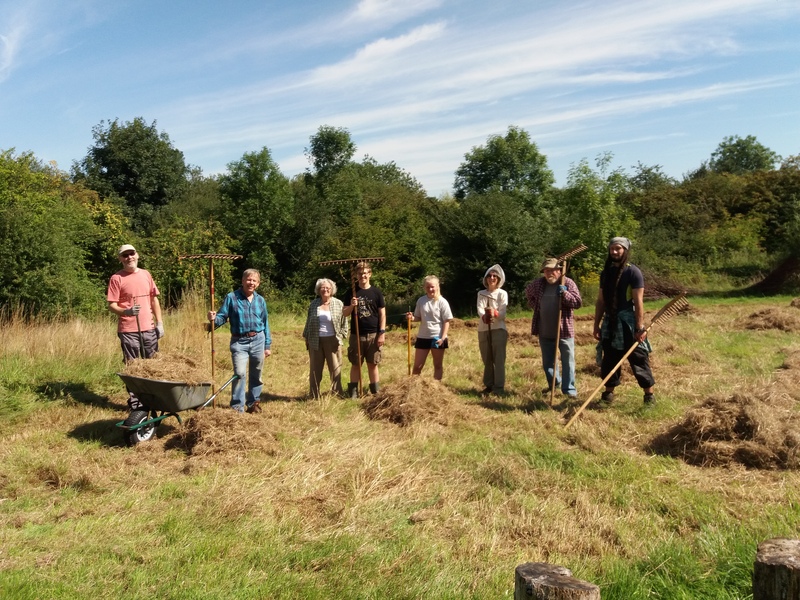 But in the end we managed to to the main cut in both fields and with the help of a brilliant gang of volunteers we even managed to rake up the somewhat soggy hay. Thanks to all for your hard work. 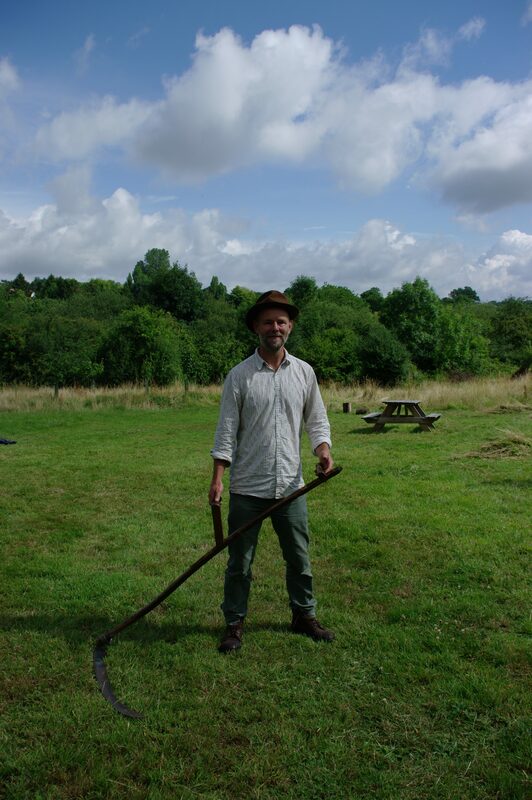 We had a lovely Saturday afternoon on the 22nd July when Nick Edwards came with his trusty scythe and showed us how to cut a meadow in the traditional way. Some of us had a go with varying degrees of success – he made it look so easy! Although it rained a bit we all huddled under the Marquee and Yurt and enjoyed plenty of teas and cakes whilst browsing the bookstall. 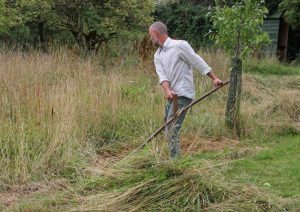 Scything certainly beats using a strimmer! Thanks to Dave Smith for kindly donating his time and expertise carrying out summer pruning of the plums in June. We all learned a lot and had an ejoyable hour or two in the lovely weather which brought out a dazzling display of butterflies. We had a great turnout for our Easter Family Picnic event. Lots of children and their families from 1-year olds to ninety year-olds came a long and enjoyed the lovely weather! 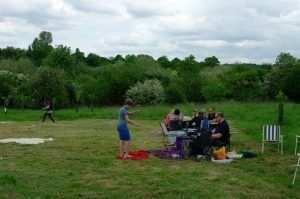 The children joined in activities including insect hotel building, bug collecting and of course, an Easter egg hunt or just enjoyed exploring the field, whilst Mums, Dads and Grandparents just chilled out. 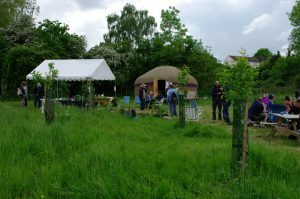 A very enjoyable event and just what the orchard is for. A very big thanks to everyone who supported our ‘Dancing for the Orchard’ fund raiser on Saturday 25 March. 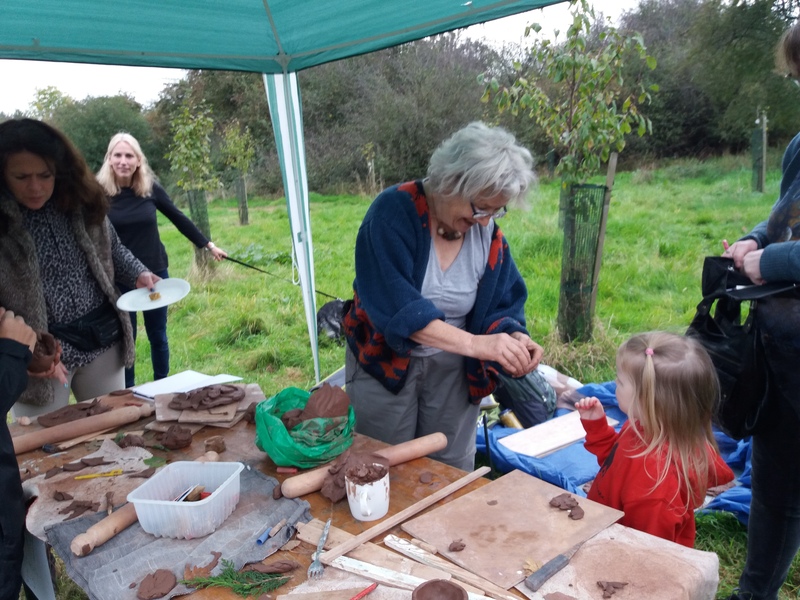 It was a really great family event with all ages, from 8 to 80+ coming along and enjoying the fun. Gareth and his beautiful harp kicked off the evening with some quieter entertainment so that everyone could have a good chat. This was followed by the brilliant Resonance Band which soon had everyone up and dancing the night away. 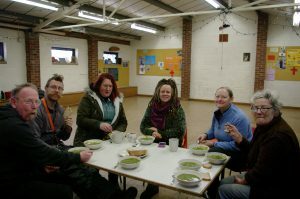 Thanks to the wonderful musicians, to Pippa for her very persuasive raffle ticket selling, to Donna for her amazing energy in organising and running the bar and to everyone, too many to name, who turned up to set up the hall and helped pack it away at the end. We are so lucky to have such a great team working for the Orchard. 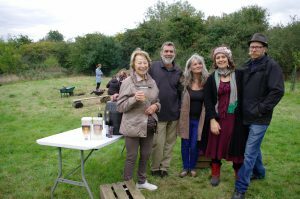 We raised £380 towards improving access to Ash Field – great stuff! 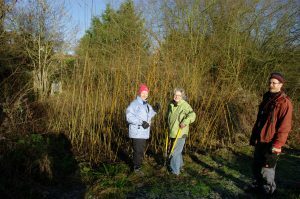 We had an excellent day harvesting our willow bed on Thursday 5th January with the help of Mel from Hertfordshire Basketry who kindly came to lend a hand. It was chilly but beautiful and we got a lot done. 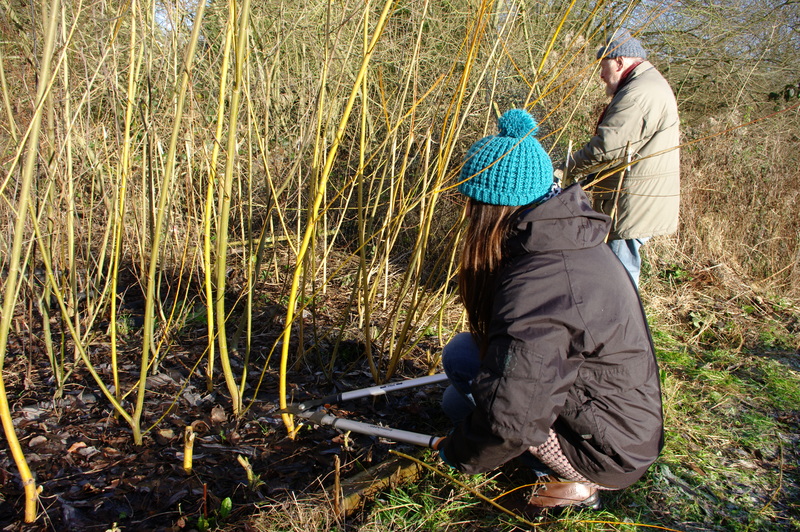 We now have 17 varieties of willow bundled up, labelled and ready to use. 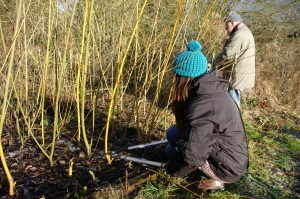 The willow will be used to create a sculpture in Ash Field – if you’d like to come along and help or just see how its done, we are planning to do this on Thursday February 9th (and there’s always loads else to do too!). Check the Events page nearer the time for details. Making a start with Mel. 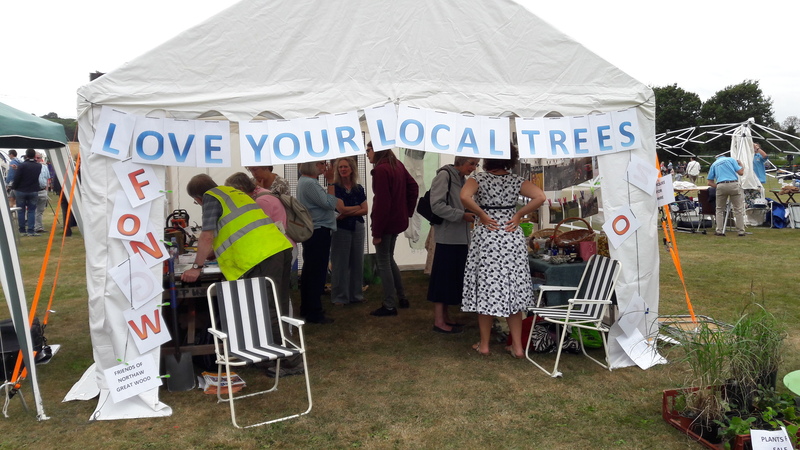 Village Day – rather breezy! 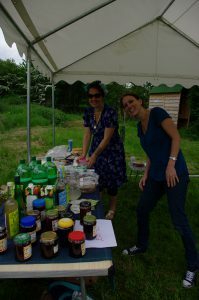 We were blessed with unexpectedly fine weather on Sunday 22 June for our Family Picnic event which enabled us to have a quick whizz round with the tractor and mower before everyone arrived. This was a very enjoyable afternoon. 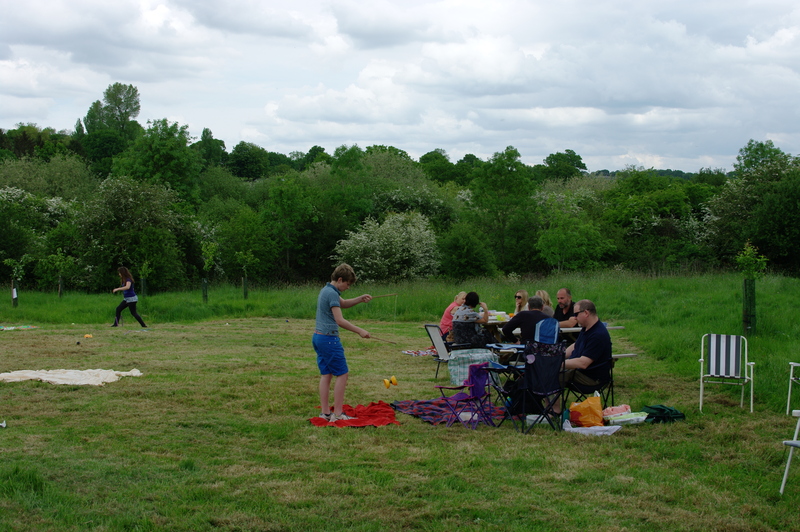 Lots of children had fun playing games in the open space while the grownups enjoyed tea and cake in the sunshine. 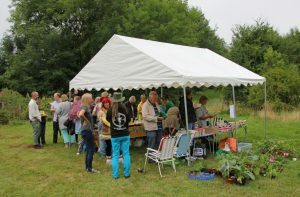 There were plenty of cakes to buy as well and an excellent selection of plants for sale which, together with a guided Herb Walk, all raised funds to support the project. Thanks to everyone who donated cakes and plants and to the Scouts for the use of their trusty urn. 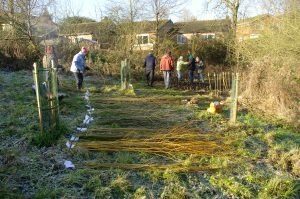 Before Christmas we took delivery of 750 free native hedging plants sponsored by Brown & Carroll Ltd., a company based in Basildon, through a scheme called Time4Trees. 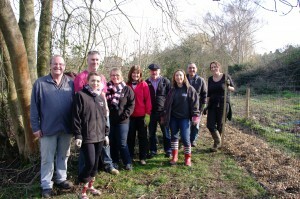 Employees from Brown & Carroll and their associated company ISG, sportingly came to help with the planting in February along with volunteers from the Friends of Northaw Great Wood. We had lovely weather and a great day putting in hedging along the southern boundary of Ash Field helped by a lunch break at the Two Brewers and the kind loan of the facilities in the Scout Hut – many thanks to everyone who helped out and also to The Tree Feller Tree Surgery for the donation of mulch. 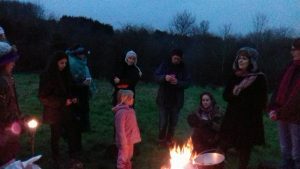 Along with community orchards throughout the UK we carried out a traditional blessing or ‘wassail’ in the orchard on a snowy Sunday evening in January. Traditional wassail songs were sung, and a wassail King and Queen appointed who led a parade around the orchard accompanied by much banging of musical instruments to drive away bad spirits. 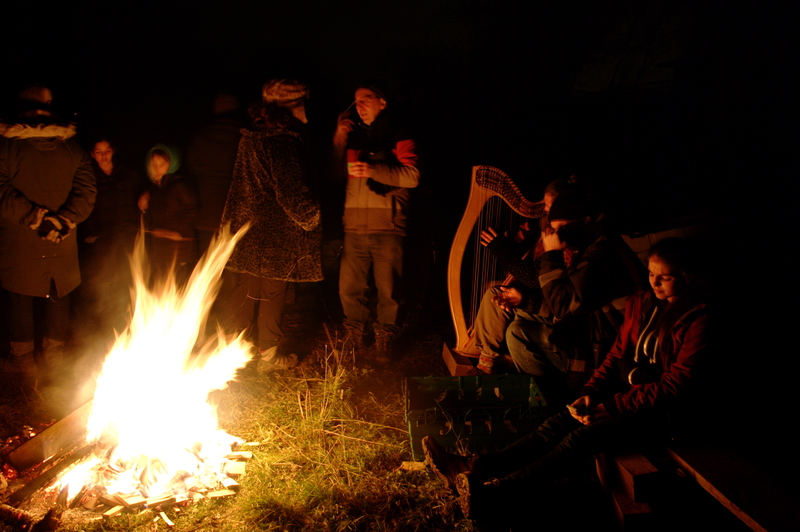 The ancient custom of hanging toast soaked in cider from the trees followed!Everyone enjoyed warming themselves around the bonfire, drinking mulled apple juice and listening to the gentle sounds of a harp as darkness fell. We were thrilled when the Orchard was awarded joint first place at the CPRE Hertfordshire Rural Living Awards in October 2015. Well done everyone! 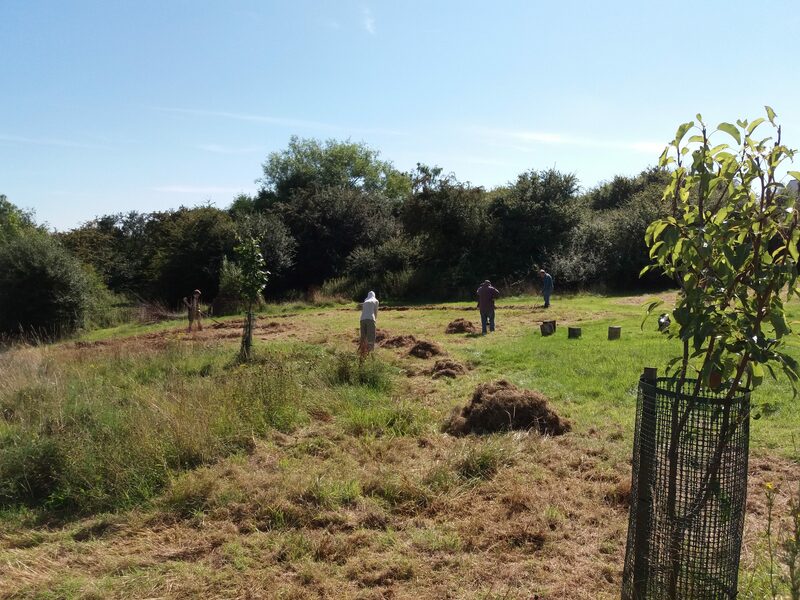 The Community Orchard is a public space for all to enjoy and we rely on the help of volunteers to make it a special place for everyone. 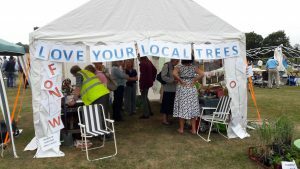 Send us a message or just turn up to one of our events listed on the Events page.